New security camera technology is giving homeowners even more ways to protect their homes. Law enforcement officials say this technology can be very helpful in fighting crime, but that not just any setup is going to get the job done. Katherine Hert has three security cameras at her home in Montgomery and she says they make her feel more secure. “I was alerted to motion detection in my driveway,” she explained. She caught a man on camera at her home in the middle of the day and got a notification of motion in her yard to her cell phone. Police were called to the home but they say no crimes were committed. 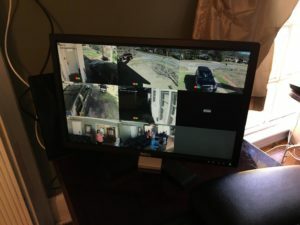 Wetumpka resident Adrian East has a system of eight cameras at her home, as well as the Ring Doorbell app that lets her look at live video of her front door 24 hours a day. “I can see who is coming up to my door before they know, I know they’re there,” East shared. At her home, you can be seen on her security cameras when you’re walking up the driveway and when you get to her carport. She even can catch unwanted guests inside the home when they walk in. Montgomery County District Attorney Daryl Bailey says he’s seeing this type of technology more and more, and he just won a robbery case because of security cameras. “It could protect your property, and very well could protect your life,” he noted. He adds, though, that you have to have a high quality system to actually help law enforcement solve a crime. “You want to look at the reach, if I can reach up and grab or turn the camera, as a criminal I might be thinking in that way,” adds Cpl. David Hicks with the Montgomery Police Department. He says criminals may cut the wires on your cameras or even steal the computer where you have the video stored. Both the Montgomery Police Department and the District Attorney’s office say they can help with selecting the right system for your home.